11'-0" (3353 mm) Dia. x 19'-0" (5792 mm) Long Chamber for explosives research. 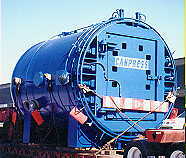 Built with all operating mechanisms, hydraulics, controls and computer data acquisition.